There's a lot of small fry in uranium, but only one giant. Uranium is the fuel that powers nuclear electric plants. There are some 430 reactors operating today that are expected to consume around 165 million pounds of uranium this year. Although there are numerous companies that mine for it, most are small or uranium is only a tiny part of their business. That leaves one name as the best stock in uranium: Cameco (NYSE:CCJ). Giant global-mining powerhouse Rio Tinto (NYSE:RIO) mines uranium, but it only accounts for around 1% of the top line. Buying Rio Tinto doesn't really get you uranium exposure. Then there are players like Energy Fuels Ordinary Shares, which is focused on uranium. It just bought a competitor and has plans to be one of the leading suppliers of uranium in North America. 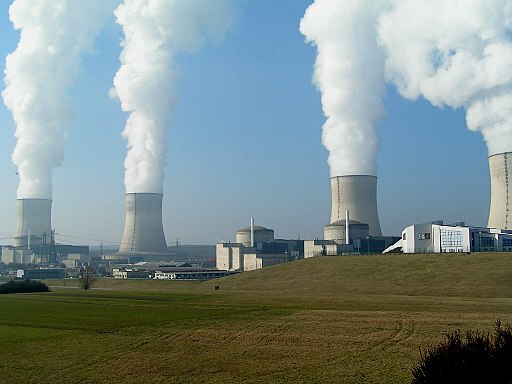 Nuclear Power Plants in France. Source: Stefan Kühn, via Wikimedia Commons. Energy Fuels hopes to sell around 400,000 pounds of uranium in the second half of the year. Cameco's first-half sales totaled more than 14 million pounds. There's a scale difference here. And while you might think a smaller company can grow faster, Energy Fuels' market cap is around $140 million, and that's pretty small -- most investors would be better served with a larger company. Cameco's market cap is nearly $5.5 billion. Oh, and Cameco made money in the first half while Energy Fuels bled red ink. Sure, you can buy a small fry and take on the risks inherent to tiny companies or you can buy the industry's 800-pound gorilla. How much for that Gorilla in the window? The thing about Cameco is it's out of favor right now. Uranium prices, like the prices of so many commodities, have been weak. That's kept a lid on top-line growth and put expansion plans on hold. However, it looks like there will be plenty of demand for uranium in the future, with over 80 new nuclear plants expected to be opened between now and 2024. Around 60 of those are currently under construction. And here's a fun fact: Cameco controls around 30% of the world's current uranium supply. As countries like China and India build out their nuclear fleets, Cameco is in the catbird seat for volume growth because it has deals with both countries to supply uranium. And the projects it has mothballed in the downturn can be restarted when demand starts to increase. While there's never a sure thing in finance, Cameco is positioned exceptionally well in an industry that appears to have demand growth baked in. So, uranium is out of favor and Cameco's results have been relatively weak. Thus, it's trading at a price-to-book-value ratio of around 1.3 times compared to its five-year average of 1.9 times. It's price-to-cash-flow ratio is sitting at about 12.5 times compared to a five-year average of 16. And the stock's dividend yield is about 2.3%, but it's averaged around 1.8% over the last five years. A model of a Toshiba nuclear power plant. Source: na0905, via Wikimedia Commons. Cameco, then, is trading cheaply relative to its recent history. To be completely fair, a turnaround in Cameco's business isn't going to materialize overnight. But as noted above, key nations are investing heavily in the technology despite nuclear power's bad image. Even Japan has started to reopen nuclear power plants after shutting down all of its fleet following the Fukushima disaster. And don't forget that nuclear power plants don't emit greenhouse gases -- another reason to like the fuel. If you take a good look at the world, you'll find that there are millions of people lacking reliable access to electricity. But electricity is what allows countries to move up the socioeconomic spectrum. Which is why countries in Asia are building new power plants as fast as they can. And while coal, natural gas, and other power sources will likely see demand grow, uranium will be right there with them. And Cameco will be there to provide the fuel. It's hard to buy when everyone else is negative, but if you have a contrarian bent, Cameco is probably the best uranium stock around.